"Hee, hee, hee," giggled Faruk as he hid in the bushes surrounding the pond. He watched the rest of the flock gathering at the lake’s shallow edges. It was feeding time and soon it would be time to sleep. The sun sank below the horizon, casting its rays into the darkening sky. The evening sunset was ablaze with bright, vivid oranges and pinks that reflected off the flock’s coral pink feathers, making each flamingo glow like burning embers of a dying fire. Soon all the flamingos, except Faruk, had their long, sinewy necks curled onto their soft, feathered backs. Their curved, black-tipped, yellow bills nestled into the feathers and all dozed off. Each stood on one long, spindly leg, while the other was tucked under their bodies. Faruk began to giggle again, "Hee, hee, hee." He snuck out from the bush he’d been hiding behind and crept towards Abdul, another flamingo. As he neared, he covered his bill with his wing and softly giggled, "Hee, hee, hee." His webbed feet sunk into the mud as he approached the water’s edge. He had to be careful not to splash as he waded out to Abdul. He took his strongest leg and kicked Abdul’s leg out from under him. It bent at the knee and Abdul fell backwards into the water. He woke up squawking, his wings flailing about. He splashed and made a lot of noise. Faruk ran as fast as he could and hid behind the bush before the other flamingos saw what he’d done. The whole flock looked at Abdul. They were angry with him for waking them up. He stood up, shook the water out of his feathers and looked around. How had he fallen? He wondered for a few minutes and then unable to figure out a reason, he tucked his head down, lifted his leg, carefully placed it under his body, and fell asleep. The rest of the flock did the same. Faruk giggled, "Hee, hee, hee," as he hid behind the bush. When he saw that all the flock was asleep, he crept towards Fatima, a beautiful female flamingo. She was sleeping soundly, her beautiful orange eyes shut tightly. Faruk crept towards her. His webbed feet made sucking sounds but when he reached the water, they went to silence. He giggled. "Hee, hee, hee." He hurried and put his wing up over his bill so the noise wouldn’t wake her up. The water was a deeper here than where Abdul had stood. Faruk crept closer and closer. He reached over and pushed Fatima’s leg with his. It collapsed and she went down into the water. He darted back to the bushes and hid. 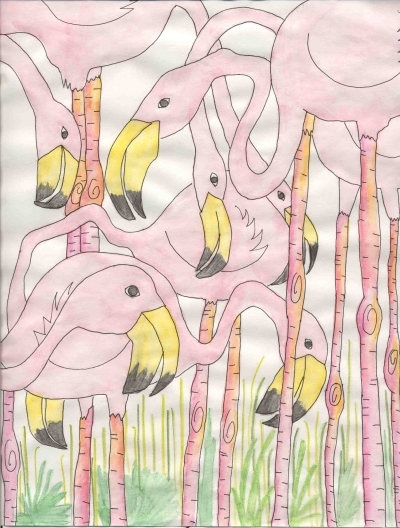 Fatima coughed and choked as she gulped down the water all over the other flamingos. The whole flock woke up. Abdul looked over at Fatima. He wondered how she’d fallen into the water, just like he had. Fatima stood back up and looked around at the other birds. They were glaring at her. She looked over at Abdul. He shrugged his wings at her and then went back to sleep. Eventually the whole flock went back to sleep. Fatima couldn’t imagine why she’d fallen over. Not being able to come up with an answer, she went to sleep too. Faruk hid behind the bush. He giggled and giggled. "Hee, hee, hee. Hee, hee, hee." His long neck bobbed up and down as he chuckled to himself. He waited a few minutes to make sure all the other flamingos were sleeping. Ahmed stood off by himself. His eyes were shut tight and he was making some soft snoring sounds. Faruk could tell he was asleep. He came out from behind the bushes and ever so quietly walked towards Ahmed. His feet made the sucking noises in the mud again. He stopped to make sure that none of the other flamingos woke up. Satisfied, he moved towards Ahmed. The water swirled around his long legs as he moved. He stood in front of Ahmed and softly giggled. "Hee, hee, hee." Ahmed stood silently as Faruk slipped underneath. His long legs went up into the air. Faruk ran and hid behind the bush. Ahmed bobbed up to the top of the pond and started squawking and coughing. Water gushed out of his beak as he coughed. The whole flock woke up again. This time they were annoyed. That was three times they had been woken up. What was going on here? Abdul wondered. That’s three birds in one night. He was first and then Fatima and Ahmed. This had never happened before. Ahmed stood up and received angry glares from all the other flamingos. They squawked at him and some even splashed water at him. He moved further into the lake, off by himself and shook the water out of his feathers. He looked around at the bushes, but couldn’t see anything. He even looked up into the sky. He could not figure out how he’d fallen. He thought he must have been dreaming. Without solving the puzzle, he fell asleep. The others finally settled down and dozed off once more, all but Abdul. He was determined to find out what was going on. He pretended to go to sleep. He tucked his head on his back, he lifted his leg and put it under his body, but he didn’t shut his eyes. Behind the bush, Faruk was giggling once more. "Hee, hee, hee. Hee, hee, hee." He was having so much fun. He thought he’d play that trick on one more bird and then go to sleep himself. He was getting tired. He came out from behind the bush and snuck around on the muddy shore of the lake towards Sara. She was sound asleep. Her feathers glowed in the bright moonlight. As Faruk crept towards Sara, Abdul watched. Now it all made sense. He stood and watched as Faruk moved into the water. He didn’t make a noise as Faruk knocked Sara into the water and ran back into the bush. Sara fell deep into the water. Her long neck flew backwards, water ran into her bill, and she came up coughing and squawking and kicking her legs as she tried to find her balance. This time all the flamingos had enough. They were all angry. Since none of them had been able to sleep much, they decided to stay awake and feed at night for a while. All the birds stuck their bills upside down into the water and scooped up algae and little fish. Abdul watched Faruk. Faruk was hiding in the bushes, giggling as he watched Sara stand up. He thought it was funny that she didn’t know what had happened, or why she’d ended up in the water. After she’d shaken off her wings she ate with the others. Faruk giggled, "Hee, hee, hee. Hee, hee, hee." He soon realized that none of the birds were going to go back to sleep. His tricks were over for the night. He came out from behind the bush and mingled with the other flamingos; but Faruk was sleepy. Instead of feeding, he curled his long neck and bill up on his back, tucked his leg under him and fell asleep. Abdul decided it was time to teach Faruk a lesson. He moved over towards the sleeping bird. The other birds were all busy feeding and didn’t even notice what he was doing. He stepped closer, his webbed feet made all kinds of sucking noises in the mud, but he didn’t care. He splashed in the water and came right up to the exhausted Faruk. Without hesitating, he kicked Faruk’s leg, which folded up as Faruk fell into the water. Abdul ran off behind the bush. Faruk coughed and coughed and choked as the water rushed into his bill, his eyes, and down his long neck. His webbed feet flew up into the air. Mud stuck to his beautiful wings as he struggled to stand up. None of the other birds helped. None of them were paying attention. Faruk finally got to his feet and shook the water off. He looked around at all the other birds. Nobody seemed to notice what was going on. As Faruk stood there in confusion, he heard, from behind the bush, "Hee, hee, hee. Hee, hee, hee."